I had a girls night get together recently and everyone was bringing an appetizer to share. I needed to make the appetizer and get dinner ready for the family too, so I figured I would do one recipe that took care of both needs and would give us enough leftovers for a couple of more meals. One of our favorites is creamy Buffalo Chicken in the Slow Cooker. Buffalo Sauce (at least 1 3/4 cup per pound of chicken) I like Sweet Baby Rays sauce, its the perfect level of spiciness for me and my little ones and looks like this. Place the chicken at the bottom of the slow cooker, add 1 cup of Buffalo sauce per pound of chicken. If you’re cooking a lot of chicken at once, (I did 4 lbs.) add a bit of water and/or chicken broth so the chicken is almost completely covered. 20 minutes before the end of the cooking time, open the crock pot and remove most of the cooking liquid and set aside. Place the cream cheese on top of the chicken, replace the lid and cook for another 20ish minutes. The cream cheese won’t melt, but will soften enough to be mixed in. Add some of the chicken cooking liquid back in to to chicken mixture a spoonful at a time so the buffalo chicken is super moist and juicy, but not dripping. Mix a generous handful of shredded colby jack cheese to the chicken mixture and put the buffalo chicken in a pretty oven safe serving dish. Top the chicken with more shredded cheese and bake at 400 until the cheese is melted and bubbly. Yum Yum Yum! 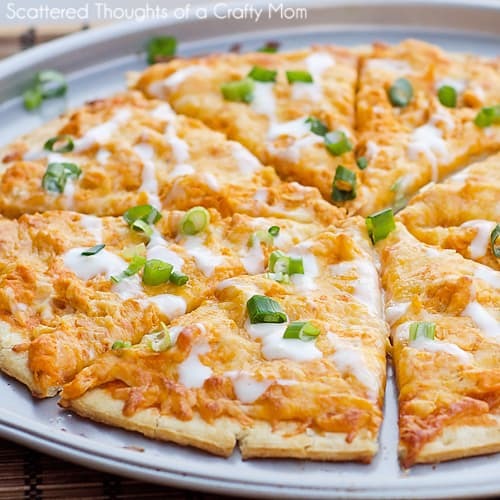 This looks incredible, I absolutely love Buffalo Chicken Pizza! I love this kind of pizza! I just love to use a fabulous recipe that can really work for a couple of meals. 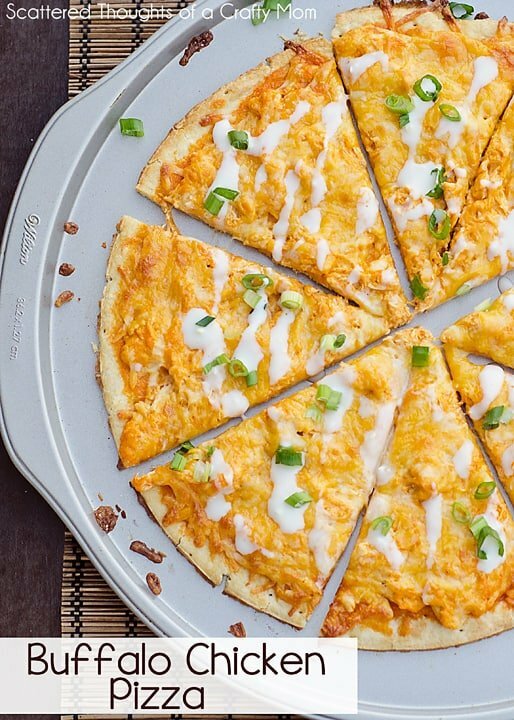 Your Buffalo Chicken Pizza looks delicious, this is a great recipe! Thank you so much for sharing with Full Plate Thursday and have a great week! l adore cooking once and eating twice! I am pinning this as well and adding it to my Meal Plan next month!! This sounds easy and delicious! My kind of meal. Yum! That looks amazing, I would love to try this recipe. What a great idea to cook once and eat twice! Especially when it involves buffalo chicken. My family will love this!! 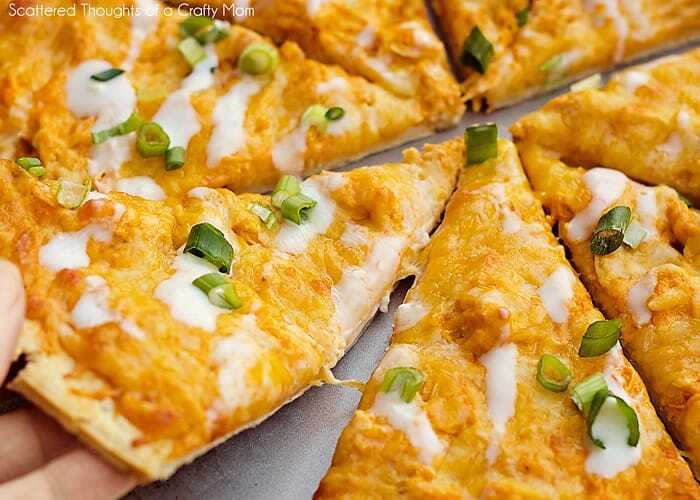 Yum, Buffalo Chicken Pizza is my favorite! And I like it spicy! I like buffalo chicken so much I had to devote an entire board to it on Pinterest! I added this recipe to it! Thanks for sharing. Looks very yummy, pinning this one, sounds like a keeper! Hi Jamie, this looks AMAZING! You have just made my favorite food (buffalo chicken, I can't get enough of it) even better. I can't wait to try this on our next pizza night this week. It sounds SO GOOD! I made this today and it tastes SO good! getting ready to make the pizza for dinner. Question – do you save the juice/sauce that you don't add back in? I'm wondering if I could put it in a jar and use it next time? thanks! I'm glad you liked it! I don't usually save the juice, though if the chicken looks a little dry, I'll add a bit more when I put the leftovers away.